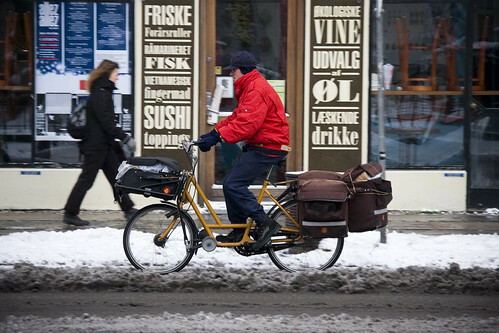 Copenhagenize.com - Bicycle Urbanism by Design: Keep Posties Cycling! The Royal Mail recently decided to scrap bicycle delivery and switch to electric trolleys that are shipped out by vans. This would not only make a postal workers’ job less fun, but will have a negative impact on both road safety and the environment. CTC – the UK’s national cyclists’ organisation is campaigning for the Royal Mail to use cargo bikes and tricycles to deliver letters and packages instead, this is already the norm in other European countries. CTC has launched a campaign to 'Keep Posties Cycling'. As well as hundreds of people sending us letters expressing their concerns about Royal Mail's plans, many postmen and postwomen have told us about why they love doing their work on bicycles and can’t believe that the Royal Mail are planning to force them to travel by van. To take part in the campaign it only needs a few clicks on the CTC website. The online form automatically generates a letter that will be delivered in one load by cargo bike to Royal Mail’s new Chief Executive Moya Greene at Royal Mail's headquarters.